As a company dedicated to elemental microanalysis, we at Exeter Analytical have a long running history of CHN testing for over 25 years. The depth of knowledge and experience that Exeter Analytical has built up to enable optimised CHN determination in applications involving water and air filtration, marine sediment, soil, geological samples and waste materials is unparalleled. 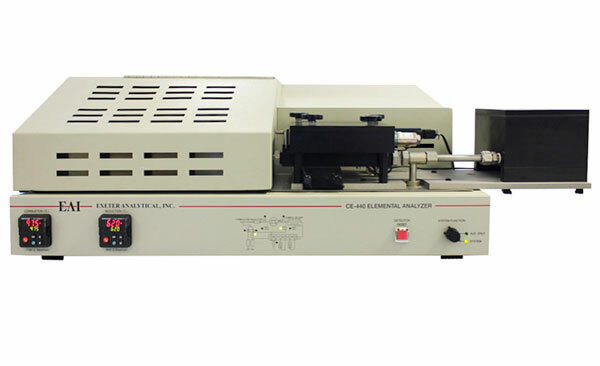 The Exeter Analytical CE440 is a static combustion CHN elemental analyser, with a unique horizontal furnace design, which enables easy elimination of filter and sample ash between each test. Consequently, one combustion tube will analyse in excess of 1000 samples without the need for removal and cleaning. In addition to this, the CE440 provides sample analysis time of less than 5 minutes, is low cost per analysis and enables you to achieve the highest quality data for your samples. By comparison to other elemental analysers, employing vertical furnace designs need cleaning after as little as 20 samples, larger filters have to be sub-sampled several times and corrective calculations made to enable analysis. Effectively eliminating troublesome residue build-up the gas flow characteristics of the CE440 analyser are superior to other elemental analysers thereby providing longer-term calibration stability as well as enhanced accuracy and precision for measured sample data.